Mass at a Cathedral in Guangzhou. Affrican residents have streamed into the prosperous cities of Guangzhou, Beijing, Shanghai, and even to some second-tier cities. Nestled in apartments and offices throughout the southern Chinese city of Guangzhou are dozens of improvised churches that cater to the region’s Pentacostal Africans, largely from Nigeria. 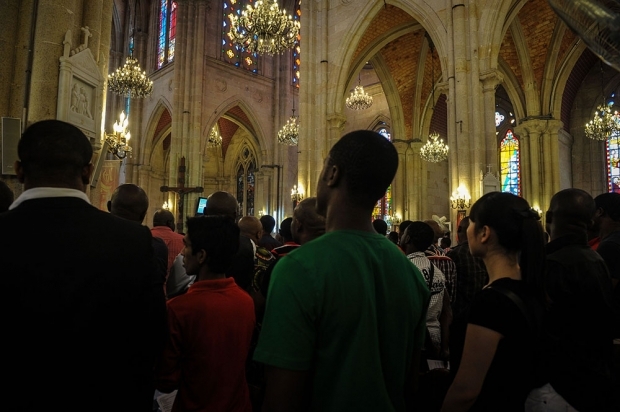 These churches not only serve the community’s religious needs but also act as a sort of cultural refuge for African migrants living in Guangzhou. National Tsing Hua University (Taiwan) masters candidate Chen Yirong is among a small group of foreigners who have gained access to these seldom seen churches as part of her research on the religious patterns of African migrants in southern China. Chen joins us to discuss the role these churches play among Nigerian migrants and the difficulties they face in avoiding detection from Chinese authorities.